HAPPY DONABE LIFE - Mrs. Donabe's Rustic Japanese Kitchen: Summer vegetables "Nanban-zuke"
"Nanban-zuke" is like a Japanese-style escabeche. Deep fried ingredients are marinated in the vinegar-dashi based broth. This kabocha "nanban-zuke" is one of my summer regular dishes, and very popular among dinner guests, too. Kabocha and Summer Vegetables "Nanban-zuke"
1. Sprinkle some salt to the eggplant and leave for 15 minutes. Rinse quickly and wipe off any excess moisture. 2. Combine the ingredients for the broth in a large bowl. Add the carrot and dry red chili. Set aside. 3. Set the oil in a deep-fryer at 350F degrees. 4. Deep-fry the ingredients one kind at a time, starting with the garlic (it will infuse the nice aroma in the oil). 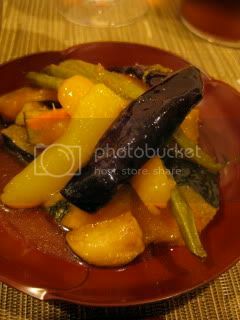 (About 2 minutes for garlic, 3-4 minutes for kabocha and eggplant, 1 minute for haricot verde and bell pepper). 5. After each kind of ingredients is cooked through (should be light golden color), lightly drain the excess grease and transfer to the bowl with the broth to marinade. 6. Leave the deep-fried ingredients in the broth for 1 hour or so. Transfer to a serving bowl. Serve at a room temperature. If you marinade overnight, the flavor will be even deeper and very nice. You can keep the vegetables in the broth in the fridge and leave it out in a room temperature 1 hour before serving.